After we bought the lighthouse in September, 2013, our whole family dove into archives and databases for as much information as we could find about Graves Light. Help poured in from all over the place: The Massachusetts Historical Society, the Coast Guard, the National Archives, antique dealers, and local people with their own pictures, documents and stories. 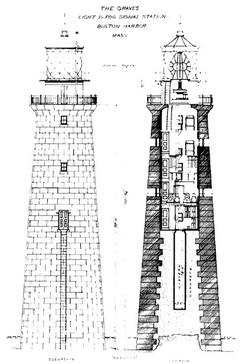 To the right is an architectural drawing from the time when Graves Light was designed in 1902 or 1903. Friends of the Boston Harbor Islands posted the drawing on its page describing our lighthouse. 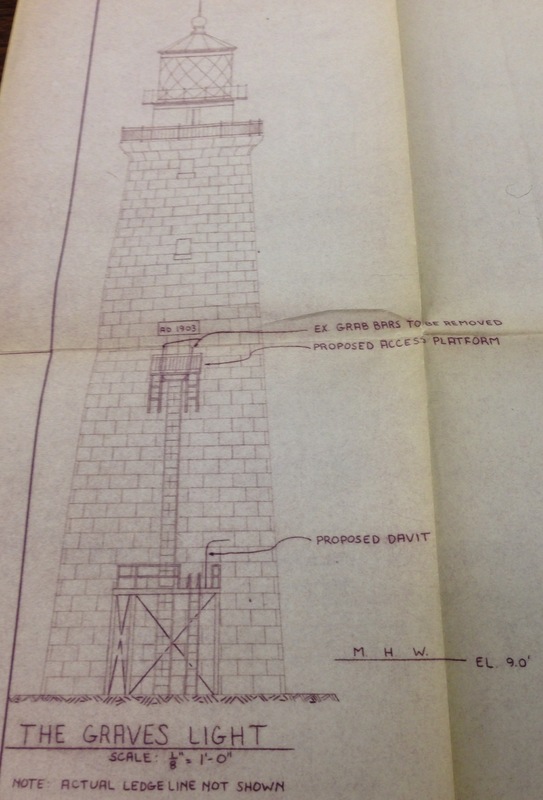 We also came up with some architectural drawings by civil engineers for the U.S. Coast Guard, just after the lighthouse had been automated in the late 1970s. We found some valuable material in a Massachusetts state archive. Below is a shot of one of the Coast Guard drawings from the 1970s, which we don’t believe has appeared online before. We claim no copyright on these images. However, we request that those seeking to reprint them provide credit to the Massachusetts Historical Society, which owns the originals; and to GravesLightStation.com, which had them professionally cleaned up for electronic publication. Great site & info Dave! Sorry about “Honeybee”! Hopefully she can be repaired?